An efficient and economic solution to your English-language media subediting requirements. Yes! youai??i? ?ve got the stories and the writers to take them just so far ai??i?? but where to find the expert editing to render them 100% idiomatic and error-free, saving you potential embarrassment and raising your publication to international standards? The Wordsmith International Subediting Desk is the answer! Why edit English online editions of local newspapers? Why edit if your readers are not first-language English speakers? Will they even notice the difference? Yes, a professional edit by an experienced English-speaking editor always pays dividends! Educated readers will immediately notice the difference and will be drawn by a quality that resonates with them. Their word of mouth and patronage will pull the broader readership along, too. Additionally, anecdotal evidence suggests that less well educated readers recognise and prefer good English even when they are unable to identify exactly how mistakes have been avoided or corrected. Your readership generally will be flattered that you consider them worth the effort youai??i? ?ve gone to! The result is that the socio-economic readership profile, circulation figures and general reputation of your publication will all rise, improving your bottom line and handsomely repaying your investment in professional editing services. Not convinced? Send a news article not exceeding 200 words for a free sample of my subediting skills. 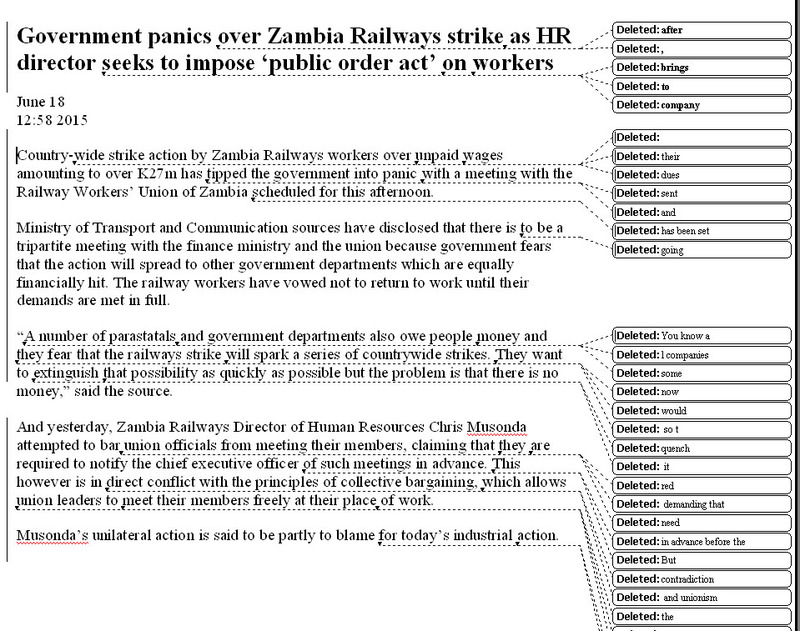 Here’s an image of a sample edit in Word ‘track changes’ – a useful tool for giving you full final editorial control. Wordsmith Editing Servicesai??i?? international subediting is a 24/7 service operating all waking hours South Africa time (GMT + 2 hours). Copy to be submitted in any plain-text, RTF or Word format and returned in Word with optional ai?? ?Track Changesai??i?? version to give you complete and final editorial control. Wordsmith Editing Servicesai??i?? primary concern is predictable work-flow. Contact me to initiate a discussion ai??i?? youai??i? ?ll be pleasantly surprised!